San Francisco is a world class city, with a world renowned symphony, ballet company, and opera company. Home to storied sports franchises, the super bowl champ 49er’s, and the former tenants of New York’s Polo Grounds - our baseball Giants. We have great art museums, incredible shopping, and some of the best restaurants in the world. If this city is lacking in any way, I’d say that we don’t have the iconic architecture that other cities have. The iconic victorians in our residential neighborhoods are wonderful and unique, and those drafty dames are hard to heat, and expensive to maintain, and they don’t build them anymore. We have some noteworthy buildings, like the Transamerica pyramid, Coit Tower, 555 California (formerly the B of A building), and one of my favorites - the underappreciated César Pelli designed JP Morgan Chase building at 560 Mission Street. One of the reasons for this is that we live in a nanny state here in San Francisco. Everyone wants to have a say about anything and everything, from what the building looks like to the height and everything in between. As such, we have lots of nondescript buildings downtown. There are good things about living in a nanny state, and bad things related to that, but the quality of life and the city services available to residents are second to none. One unique characteristic unique to our small city - since we live at the tip of a peninsula surrounded by water on 3 sides, are the iconic bridges. 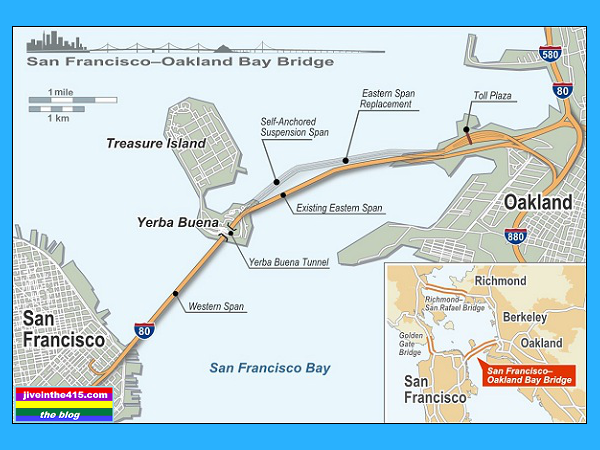 The Bay Bridge connecting San Francisco to Oakland and the east bay stands tall, overlooking the embarcadero. 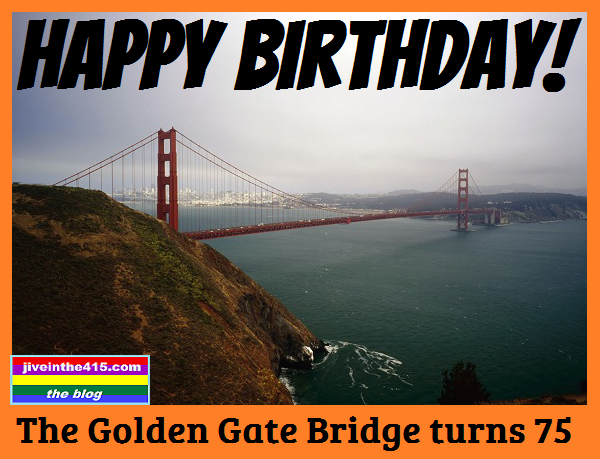 The bridge opened to traffic 6 months prior to the Golden Gate Bridge, so like its more famous sibling, it’s 75 years old too. It’s really 2 bridges, consisting of the eastern and western spans. The eastern span is going to be replaced, and the construction work is nearing completion. It’s currently scheduled to open Labor Day weekend 2013. After the new span opens, the old span will be demolished. 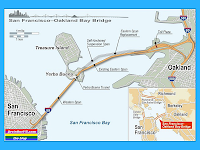 The eastern span had a portion of the bridge collapse during the 1989 Loma Prieta earthquake, so a new bridge was desperately needed. This past Sunday there was a huge city celebration for the Golden Gate Bridge and her 75th birthday, culminating in a fireworks show, and I must say they were fantastic. Despite the winter chill and fog for most of the day, the sky cleared in the evening, and the spectacular fireworks with the bridge in the background, was amazing. There seemed to be lots of tourists, and when the fireworks started, it seemed that everyone was a San Franciscan. (A word to the wise - don’t ever call our city San Fran or ‘Frisco. Aside from marking you as an out of towner - it annoys the locals big time, myself included). A waterfall of light cascaded from the Golden Gate Bridge and lit up the night Sunday as fireworks turned the San Francisco Bay and shoreline into a kaleidoscope of color. Thousands of people from all over the Bay Area lined Crissy Field to see the show and celebrate the 75th birthday of the majestic span. "It was beautiful how the city put together such spectacular fireworks," said Fernando Tercero, who came from San Jose with his wife, Jisselle, and son Fernando Jr. to participate in the waterfront celebration. "I've never seen anything like that. I've been to many events, but this is No. 1 on my list." It was the culmination of a daylong party including live music, art shows, boat parades, tearful renditions of "San Francisco (Open Your Golden Gate)" and happy, enthusiastic crowds bedecked in fleece and sweatshirts. "It's one of the most beautiful pieces of artwork in the world. What more is there to say?" said John Moore, an air-traffic controller from Rohnert Park, who walked across the bridge with his family Sunday. "We wouldn't miss this." Golden Gate Bridge officials wouldn’t allow the crowds to walk across the bridge like they did when the bridge turned 50, but it was still fun nevertheless. If you can make it to the centennial celebration in 2037, I would highly recommend that you go. With any luck - I’ll see you there! 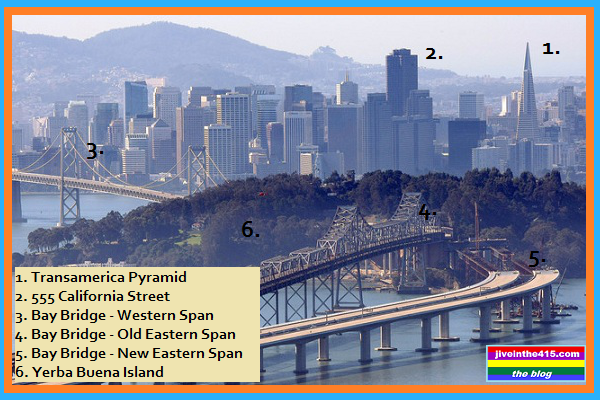 Do you have a favorite San Francisco landmark? If you do I’d love to hear what it is.